D'Youville students achieve academic success, serve their communities, and support one another throughout the year. Honors Convocation is a celebration of that work. Honors Convocation is an opportunity for the entire D’Youville community to celebrate the academic achievements of some of our top students, as well as those students who not only achieve academic success but also show great leadership ability, service to the community, and compassion for their fellow students. Each academic department honors select students for their academic achievements, and the most prestigious awards that D'Youville presents to students — the D’Youville Medal, the Grey Nuns of the Sacred Heart Medal, the Lee Conroy Higgins Award, and the St. Catherine’s of Alexandria Medal — are bestowed on students at Honors Convocation. The D’Youville Medal is awarded annually to a senior who, exemplifying the spirit and ideals of D'Youville, is deemed outstanding for achievement, service and loyalty to the college. The Grey Nun of the Sacred Heart Medal is awarded annually to a graduate student who has demonstrated outstanding academic achievement as well as service to D'Youville and the larger community. The Lee Conroy Higgins Award, presented annually by the alumni association, recognizes a senior for outstanding support of and involvement in campus activities and shows concern for fellow students. The St. Catherine of Alexandria Medal, presented by the Buffalo Chapter of Kappa Gamma Pi, is awarded annually to a junior who is outstanding in scholarship and notable for service to the college and community. Candidates for these awards are nominated by the faculty and employees of the college, with final selection by an ad hoc committee. 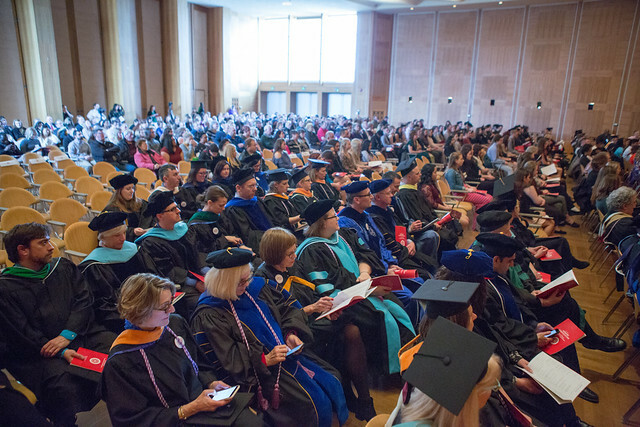 Department awards are conferred annually on those students who demonstrate mastery of subject content and exemplify service to the college and community.